2 Cycle 20 IN. Chain Saw is rated 4.8 out of 5 by 14. Rated 5 out of 5 by Surf411 from Great saw for the money Simple review: buy this saw if you don't use it for work. Best homeowner saw - period! Rated 5 out of 5 by boltaction3 from Worth every penny I bought this chainsaw to cut up some trees that are laying around my house due to hurricane Michael. It’s worth every penny and hasn’t given me any issues. It cuts through pine like butter. It eats through gas but that’s with every heavy duty chainsaw. I highly recommend this chainsaw, especially for the price, you won’t find a better deal. Rated 5 out of 5 by leslyortega95 from Great feautures!! I bought this about 2 months ago, and I'm glad I did! so easy too work with and the manual is really helpful. I totally recommend it! Never fails to do a good job. 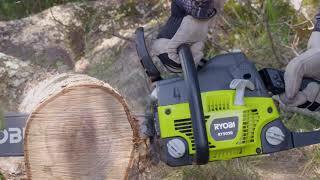 Rated 5 out of 5 by JCJ2 from Great Chain Saw This is a powerful chainsaw that does the job. It's easy to start, has a sturdy protective case, and a long enough bar to handle most any job, and a great price. 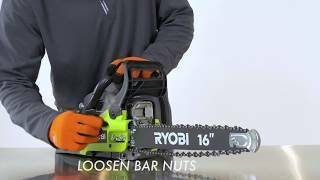 Rated 4 out of 5 by Squid4242 from Quality product I bought a 20" ryobi chainsaw almost a month ago haven't had chance to use much, but so far the quality is great. 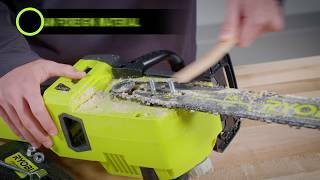 Would definitely buy another Ryobi product. Rated 4 out of 5 by Junk man from I just got it and have not used it yet but looks like a good product. Not sur about the tip guard. With its powerful 50cc engine, you can trust the RYOBI 20 in. 2-Cycle Chain Saw to get the job done fast. This saw features an anti-vibe handle to provide added stability and comfort while in use. As an additional safeguard, it has an inertia-activated chain brake to stop the chain automatically and a SAFE-T-TIP bar to protect against rotational kickback. 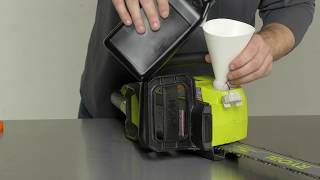 Servicing is made easy by the tool-less air filter cover and side-access chain tensioner. The adjustable automatic oiler will ensure a longer bar and chain life. With its durable carrying case, transport and off-season storage are simple and convenient. 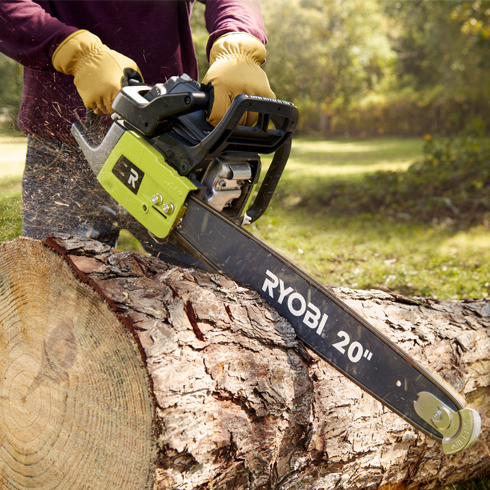 The smooth operation and 3-year warranty make the RYOBI 20 in. 2-Cycle Chainsaw the ideal choice for tackling a variety of cutting jobs.